Mosaic of TowCam photos of the new lava flows erupted during the 2005-06 EPR eruption near 9°50'N collected during cruise AT15-15 (T. Shank Chief Scientist). 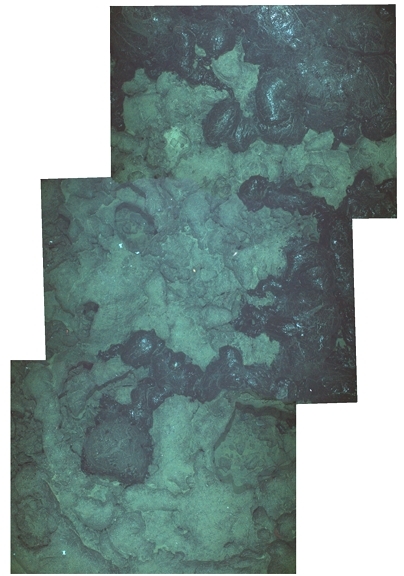 Contacts between new lava and older, sediment-dusted flow surface is obvious, and new flow thickness if often thin, <1-2 m. Each image is ~4 m across. Mosiac constructed using software developed by Yuri Zhanov (U. New Hampshire) and Stace Beaulieu (WHOI). Mosaic processed by Allison Fundis and Dorsey Wanless (U. Florida). Image courtesy of Tim Shank, Marshall Swartz, Adam Soule, and Dan Fornari (WHOI). For further information on the 2005-06 eruption, see: Tolstoy et al., 2006; Cowen et al., 2006; and Soule et al., 2007.